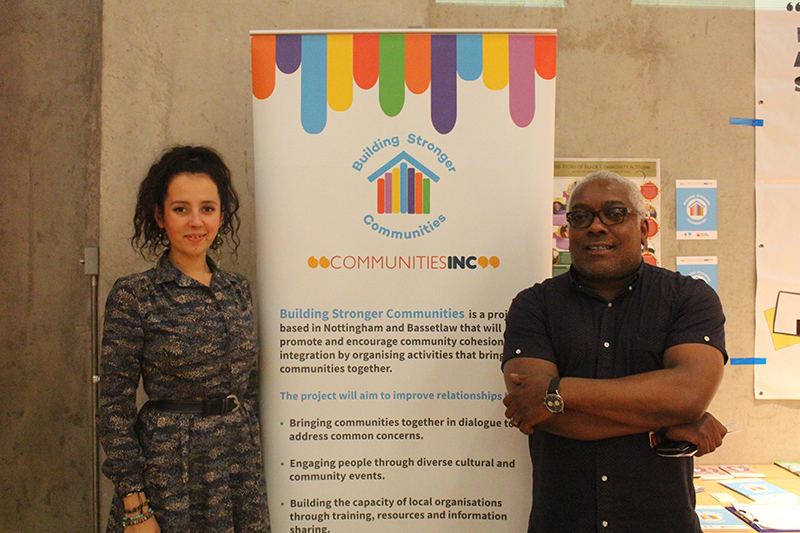 On Saturday 18th June, Communities Inc had a stall at the Launch Event of Refugee Week, held at Nottingham Contemporary. Refugee Week is a national initiative that celebrate the contribution of refugees to the UK and encourages a better understanding between communities. Refugee Week is an umbrella festival, with events held by a wide range of arts, voluntary, faith and refugee community organisations, schools, student groups and more. In Nottingham, the event is co-ordinated by Beyond Borders and runs between 17th and 27th June. The launch event at Nottingham Contemporary attracted over 500 people and was a great opportunity for the public to gain a better insight into diverse cultures, understand the challenges refugees face in the current social-political climate and find out about volunteering opportunities. Communities Inc was joined by organisations such as Oscar, Women’s Aid, Amnesty, Red Cross, Refugee Forum and Nottingham Arimathea Trust. The event was a real celebration of community cohesion and social integration, with free food tasting provided by Women’s Cultural Exchange, live music from Arian Band, drumming workshops, face painting and art installation by refugee young people and artist Hetain Patel.